You eat right and exercise regularly, but your weight loss isn’t what you want it to be. If you’re stumped as to why, you may want to take a closer look at the drinks you consume on a regular basis. Even seemingly “healthy” drinks can pack in a lot of calories and sugar that might be causing your weight loss plans to stall. Beverages really are the overlooked calorie giants in today’s fast-paced society. We down lattes, frappuccinos, and sodas like there’s no tomorrow, never stopping to consider just how many calories might go down with every gulp. Undeniably, the amount of sugar is even worse because spiked blood sugar will prevent fat loss. Even many so-called healthy smoothies might be getting in the way of weight loss. Processed smoothies – Any time a smoothie is loaded with sugar and artificial flavorings, you’re going to get more calories than you really want and the high nutritional content will be lacking. Sugary sports drinks and waters – Read labels when you buy drinks to finish off a workout. Chances are you’ll discover a whole lot more calories than you bargained for. 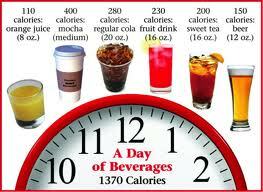 It’s best to stay away from flavored waters that get most of their flavor from sugar unless you have exceptional needs. Coffee drinks – Unless you’re dealing with honest-to-goodness coffee, be very wary. Many of today’s coffee drinks are loaded down with sugar, and this doesn’t just include the whipped cream on top! Alcoholic beverages – It is never a good idea to drink a lot of alcoholic beverages when you’re trying to lose weight. Even light beer, for example, can deliver a lot of calories and carbs. Alcohol will convert to sugar in your body. Tea – Green, white and black teas are generally perfectly okay. Adding sugar to good teas is not necessary though. And on the plus side you have the antioxidant value of the teas. No sugar added fruit drinks – Natural fruit drinks are typically kinder on the calories. This is especially so if you squeeze the fruit yourself. The better approach is to actually eat a raw fruit or vegetable. Non-processed smoothies – Make your own smoothies with ice and fresh fruits or vegetables to enjoy a tasty beverage that’s packed with nutrients without extra calories. When you’re trying to lose weight, it’s often the overlooked items that get in the way of success. What you drink can be just as important as what you eat. If you need more ideas on what to avoid, talk with your personal trainer or a health and nutrition educator. Trained professionals can offer excellent insights on the right foods and drinks to consume and those that are fraught with caloric peril.